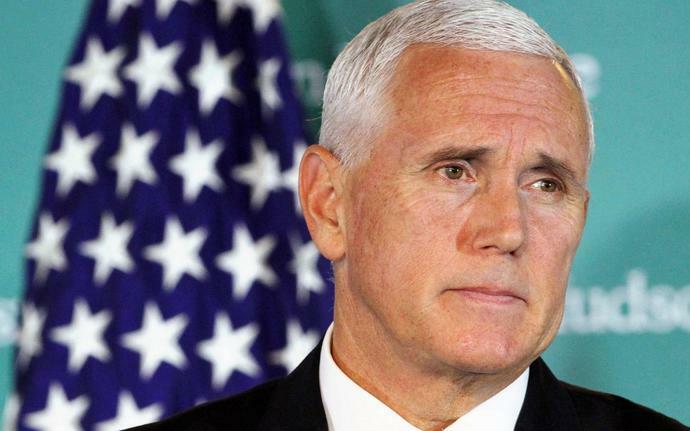 Mike Pence, the vice president of the United States, has said that Venezuela needs "action" rather than dialogue, rallying Venezuelan exiles in Miami to the cause of "interim president" Juan Guaido and demanding that President Nicolas Maduro step down. Mr Pence told the Florida gathering that "all options are on the table", and warned Mr Maduro "not to test the resolve of the United States". "This is no time for dialogue. This is time for action," he said. "The time has come to end the Maduro dictatorship once and for all." Removing Mr Maduro has been a priority for Mr Trump right from the beginning of his presidency, but has become an obsession for the White House since Mr Guaido, president of the national assembly, declared himself "interim president" on January 23. On Friday John Bolton, the national security adviser and one of the most strident Venezuela hawks, attempted to reduce the temperature somewhat, saying he did not believe US military intervention was imminent. He reacted angrily to reports that Mr Maduro was planning to send 15 tonnes of gold from central bank vaults to the United Arab Emirates in coming days, in return for euros in cash. Oil sanctions announced by the US last week are hitting hard, and Mr Maduro is becoming increasingly desperate to find means of keeping his regime afloat - including accessing $1.5 billion of gold kept in the Bank of England's vaults. "Not only does Maduro require foreign paramilitary support to keep remaining threads of a failed dictatorship, but reports show he is flying out Venezuelan assets by the plane full," Mr Bolton tweeted. "Is he stealing resources from the people to pay for Russian intervention?" Mr Guaidohas urged his supporters to take to the streets on Saturday and demand the resignation of Mr Maduro, who is clinging to power with the support of Russia, China and Iran. Mr Maduro, 56, on Friday tweeted a video of himself inspecting troops. The military, which has so far remained largely loyal, is seen as holding the key to Mr Maduro's future. Mr Guaido has appealed to the forces to defect, and wrote an open letter to soldiers offering amnesty - which many of them publicly burnt. The 35-year-old published an open letter to Mexico and Uruguay, turning down their offer of mediation in talks with Mr Maduro and saying he would only consider talks "when the usurpation is over". He argues that Mr Maduro's May election was fraudulent, and so the end of his term, in January, marked the end of his legitimate rule. He insists that, with the presidency "vacant", he, as the president of the national assembly, becomes under the constitution the "interim president". Jeremy Corbyn, the Labour leader, expressed dismay at Mr Guaido's position, siding instead with his friend Andres Manuel Lopez Obrador, president of Mexico, and criticising the British foreign secretary for calling for further sanctions. "The future of Venezuela is a matter for Venezuelans. Jeremy Hunt's call for more sanctions on Venezuela is wrong. We oppose outside interference in Venezuela, whether from the US or anywhere else. "There needs to be dialogue and a negotiated settlement to overcome the crisis." The European Parliament officially recognised Mr Guaido on Thursday, and urged the European Union to follow suit. A series of European countries, among them Britain, Spain, France and Germany, have set a deadline for Sunday for Mr Maduro to call elections, or else they will join the US, Canada, Australia, Israel and many Latin American nations in recognising Mr Guaido. Francisco Sucre, the head of the international committee of Venezuela's national assembly, on Friday called on Mr Maduro to step down. Speaking in Spain, at the end of a trip designed to rally support for Mr Guaido, he said that the "international contact group" announced on Thursday by the EU's top diplomat, Federica Mogherini, "should help to cease the usurpation of power by Maduro and establish a transitional government until new elections." He added: "There is no possible discussion here, Maduro has to leave." He said Venezuela, under Mr Guaido, welcomes the EU's involvement "because we are going to need its cooperation during the initial stages of the recovery of our country." "Power is evaporating from Maduro's hands with the passing of the hours," he said. In advance of President Trump&apos;s visit to Indiana Friday, here&apos;s what South Bend Mayor Pete Buttigieg has said about him. NEW YORK (AP) - Iran's top diplomat said Wednesday President Donald Trump's aim "is to bring us to our knees to talk" - but national security adviser John Bolton and key U.S. allies in the Mideast want "regime change at the very least" and the "disintegration of Iran."